I hope that I have got you thinking about ways to save money, to live within our means and to recycle and re-purpose items that you already have. I have had so many lovely e-mails from others wanting to change their habits this year. One of the things that worries me is the amount of chemicals that we use around the home. In the coming weeks I have lots of ideas to save money on those expensive products and to use natural and basic products around the home. One of the key ingredients in most of these ideas is Essential Oil. You can buy it from the supermarket for around $8.00 per bottle - It will last for a long time and comes in many different scents. 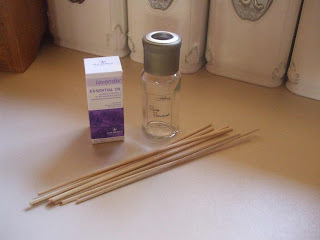 Over time I have bought or have been given many of these Reed Diffusers and have them scattered around my home to make each room smell sweet. The concept is that the sticks are embedded with the scent from the liquid and it scents your home. These are just the $2 variety from the local discount store. Once the secent dries up it is easy to make more by using water and around 8 - 10 drops of essential oil. It is also import to upend the reed sticks every few days and turn them around so the wet ends are sticking out of the jar. You can go one step further and use any type of glass jar - Wrap it in pretty fabric and use wooden meat skewers (cutting off the sharp ends). This would make a lovely inexpensive gift for a neighbour or a friend. I love to sew and quilt but one of my pet hates is the waste..... I have a scraps tub next to my cutting board and all of the scraps go into it. Ocassionally I will spend an hour or so cutting charms from them and then file them away to use on a scrappy quilt. 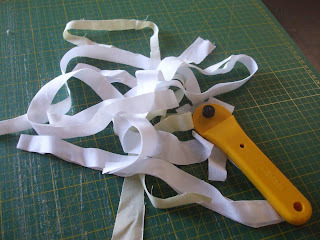 The long strips from straightening fabric are put to one side to be used in the garden. They make wonderful ties for stakes. 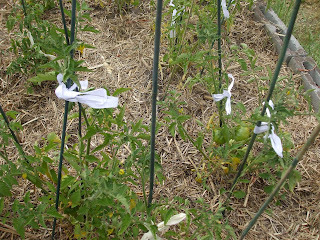 I use them on my tomatoes each year and for any new plants that I have planted to keep them straight - It doesn't damage the stem and can be re-used once you have finished with it provided that you don't tie it in a knot. 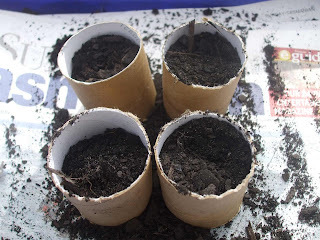 Another idea for re-using items in the garden is to save cardboard rolls from toilet rolls, paper towel etc. They make fantastic seedling pots. 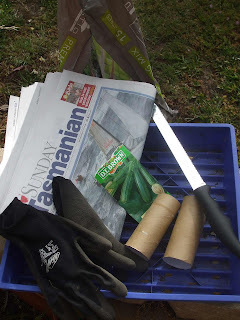 You just need a tray to put them on, newspaper, potting mix, a sharp knife to cut them with, seeds and gloves. Lay the newspaper in the botom of the tray - Quite thick. 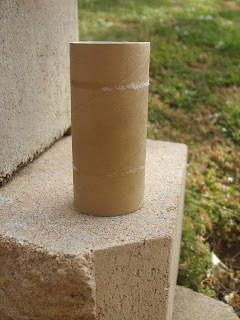 Cut the rolls to around 2 1/2 Inches high - For toilet rolls just cut them in half. 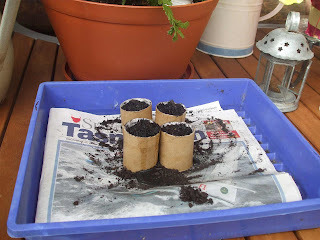 3/4 fill them with potting mix - pressing quite firmly to mould the potting mix into the roll. Plant the seed and cover with potting mix. Place the tray in a warm sheltered spot for the seeds to germinate and water. In around 10 days you will have seedlings emerge. When they are strong enough you can plant them directly into the garden - Including the roll which will break down. 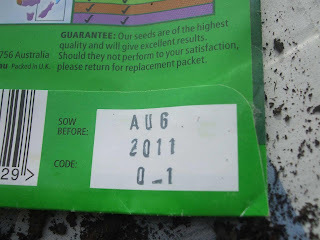 When choosing seeds it is important to choose seeds with a long expiry date. Most of the discount stores around Australia sell packs of vegetable and flower seeds for only $1 per packet. 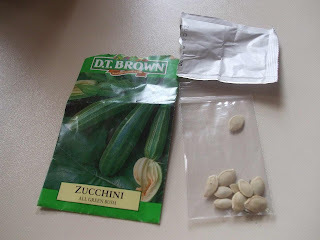 This pack of Zucchinni seeds had 20 seeds inside. If I only get 10 seeds to grow it will only be 10c per plant. Most of us do not want a huge abundance of plants growing at once so by purchasing seeds with a long expiry date you can save them for planting at a later date. It is important to keep them dry and in a zip lock bag in a draw. Zip Lock bags are a wonderful thing. They can be re-used time and time again. I use them to package up bread in the freezer. I am the only one who eats Soy & Linseed bread in our house so each time I buy a loaf I break it down into packs of 4 slices and freeze. I always keep the bags to be used again. 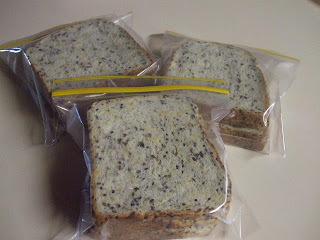 I pack our work and school lunches each day using frozen bread. By lunch time we are eating beautiful fresh bread that has thawed. If you are packing meat in sandwiches it also helps to keep it at a lovely temperature until you can refigerate it at work. I pack ice blocks with the girls lunches each day to ensure that their food does not spoil. 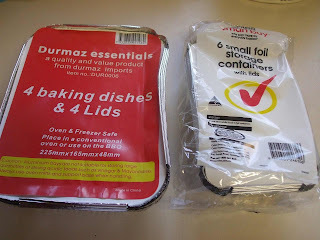 Another great re-usable form of packaging are these foil trays with lids. The larger ones are perfect for a meal for 4 and the smaller ones hold a large meal for 1 or smaller meal for 2. They are very cost effective with the larger ones working out at 50c each and the smaller ones at 20c each. I use them to freeze leftovers. I write the name of the meal on the lid and the date. At least once a fortnight I take out a selection of leftovers on a Friday morning and we have what we call in this house "Smash & Grab" that night for dinner. 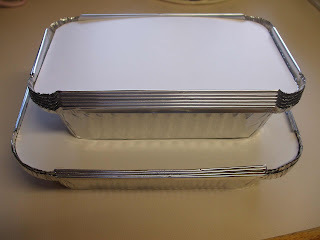 It is a great way to avoid buying take away at the end of a busy week and is a fantastic way of avoiding any waste. You just pop them in the oven with the lid on to re-heat and then you can wash them and re-use next time. Next time I will have some more tips for you and a little pattern for you to download. You have been giving it a lot of thought! Love all the tips you have given. especially the toilet roll and seed one! You are on a roll, girl! Keep 'em coming! 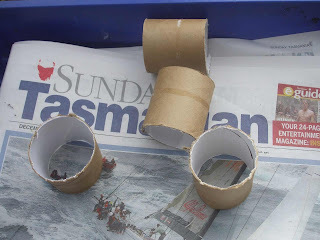 Great tips, good idea about the cardboard rolls, every little cent saved is great and any ideas for recycling are good for the environment. We appreciate all your imput, thanks Fiona, AND we are looking forward to future 'episodes'. Great tips Fiona, I'm on the bandwagon too! I bought rolls on special this morning, and plan to make up a batch of garlic bread after reading your post. I love your frugal aving tips.I love soy and linseed wel.... any seeded bread but hubby will only eat white and most of the loaf gets chucked by the middle of the week.Will start making croutons and freezing bread instead.I'm off to the shops to buy myself some soy and linseed bread just for me!Wonderful tips I can live by,thanks Fiona.Will keep looking at your blog for more inspiration and ideas :) Barb. Lots of nice tips, thanks, Fiona! I have some beautiful, expensive reed sticks and have been doing my own refills - so pleased someone else agrees and I will try the essential oil. Fiona, you are the queen of thrift! GREAT tips, thank you! Great tips, I use a lot of baking soda and vinegar for cleaning here. Thanks for sharing!! Some great ideas! Love the bread tips. I am always complaining that we seem to throw away too much bread. Also the diffuser idea - ours needs filling at the moment. Thanks for the tips. Fiona your first money post is what inspired my strip blanket , keep these posts coming , they're great thanks ! Thank you for all your good ideas! Those seedlings pots were very smart. And I liked the idea with the bread in Zip Lock bags. I am starting on the yearly "new years diet" now and then I use a special coarse bread. It will be great to freeze it this way. Happy new year to you! Keep them comming, great ideas loved the deffuser idea ,we both eat the same bread as you I love it. Hi Fee fee... great ideas! I'm going to make some diffusers tomorrow... very clever! my man bought some little peat pots from bunnings, should have read your post first! HI love this blog. I have linked it on my log I hope you dont mind!!! I love the idea of the bread bags. I am so far off the savings and frugal bandwagon right now and i needed a blog to inspire so I am so glad i found yours!! I like the toilet roll idea. I'd never thought of that. 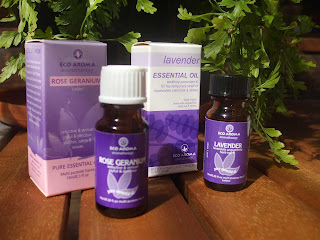 Hello Fiona,my home is now scented with rose geranium scent. I used some skewers and a little tea light candle holder that was used at my eldest daughters wedding. Keep the tips coming and congratulations on the book. Happy days. I enjoyed all of your tips Fiona. I loved the post! So many wonderful ideas so far. I can't wait for the next installment. 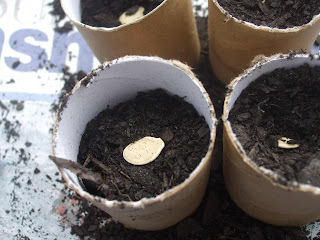 Empty Egg Cartons also make excellet seedling pots and you can put the carton portion straight in the ground with the seedling and it breaks down.